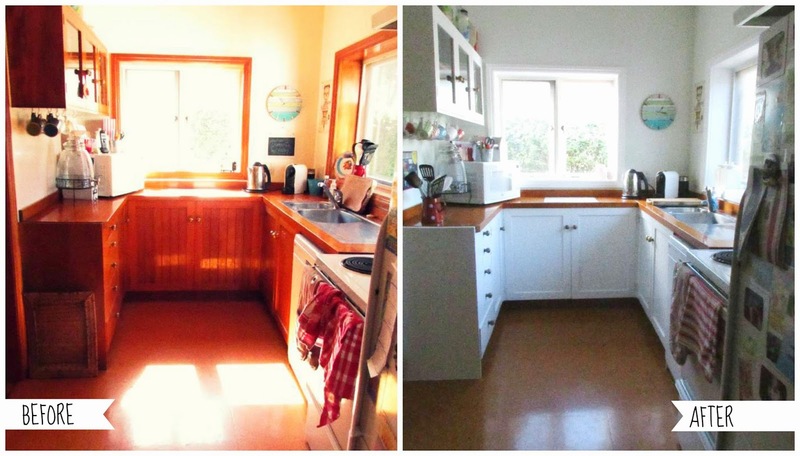 Finally after months of DIY, blistered fingers and paint-in-hair, my kitchen-dining makeover is complete. It's amazing what a difference white paint makes. 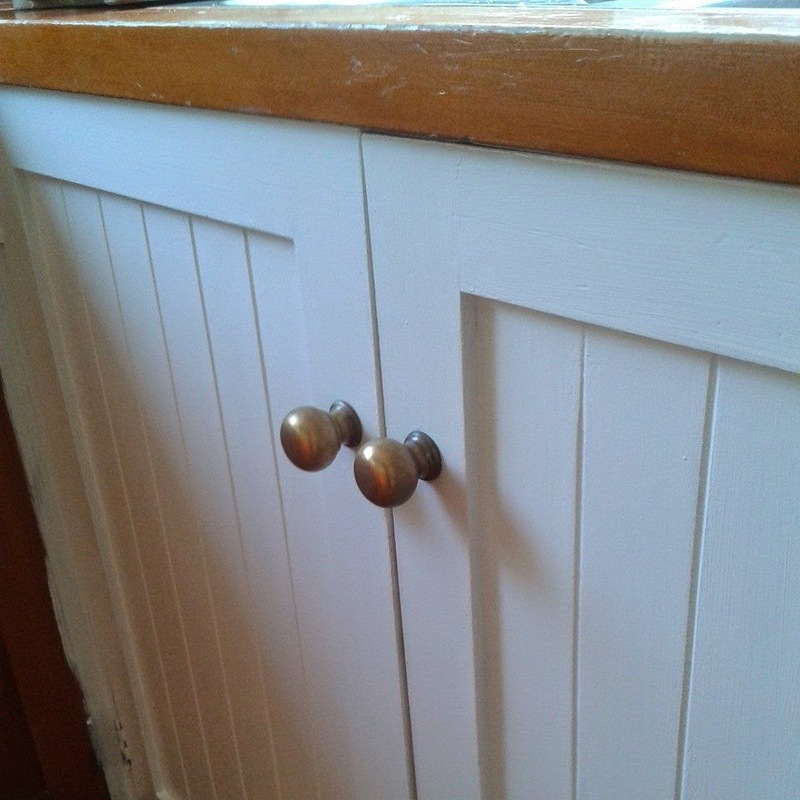 Actually the colour is Quarter Thorndon Cream, from Resene, a water-based enamel. To make the paint stick to the wood and set nice and hard, I first gave each area a very rough sand then applied a coat of Resene's "smooth surface sealer" and allowed it to dry for at least four hours before applying the first coat of paint, followed by one final coat. I worked in sections, finishing one area completely (while the kids were at school) before moving onto the next. The colour I chose for the walls was "Quarter Beryl Green" (also from Resene) - a lovely soft vintage green which is very soothing, fresh and clean. It shows up differently in different lights and is quite neutral, allowing other colours to pop. (It's tricky to capture the colour on camera, especially with my dinky point-n-shoot). The previous wall colour was a mucky pinky-cream; the walls were in terrible condition with dings and nail holes, so before painting I patched them up with some plaster and a sand - not perfect cos I'm no tradesman, but a darn-sight better than they were before. 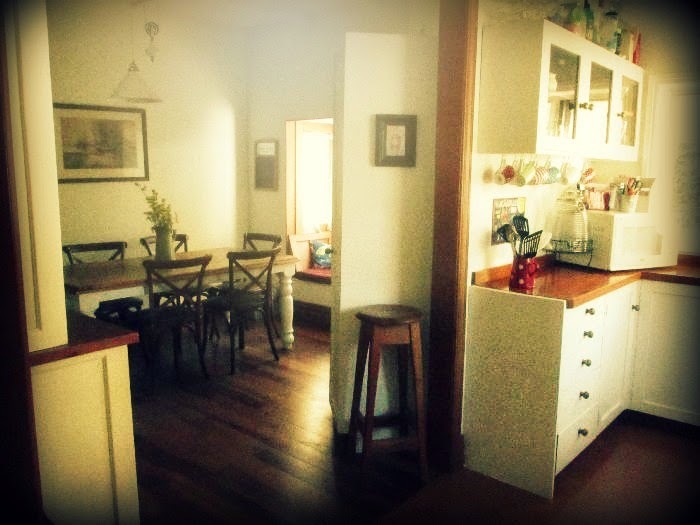 I also gave the table a mini makeover, painting the base to match the cupboards. The chairs are from the Early Settler factory shop (out near the airport), bought for $50 each. I'm a huge fan of mix'n'match, vintage and retro, so my tin sign collection is right at home in my new scheme. I plan to keep adding to it and extent it into a whole feature wall going up and over the pantry and along the narrow space dividing the kitchen and dining. The pantry has been panted white too and moved to the wall where the china cabinet used to be (my lovely china cabinet is now gracing the lounge). Our old vintage light fitting has scrubbed up well and now looks perfect over the table. I wish I had a better camera so I could show you properly how awesome it looks. 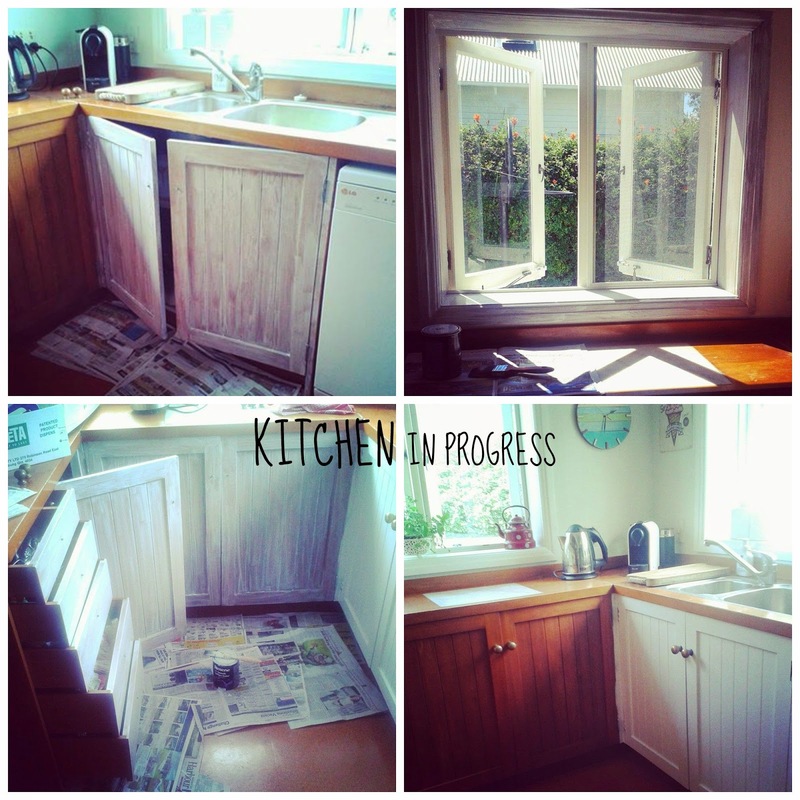 My previously wooden-overload, cobbled-together storage-poor kitchen is now my pride and joy. Every time I walk into it I smile. 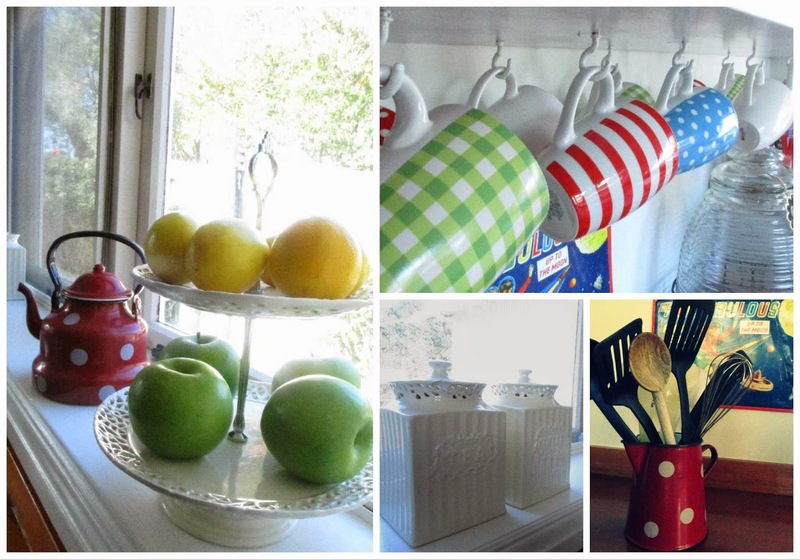 It's prettiness is inspiring me to do the dishes, keep the floor swept, fold the washing instantly. And the best bit is that I did it all myself. Picked the colours (and chose well), painted every wall, every drawer, every cupboard (and did it properly)... had a vision and saw it come together at last. 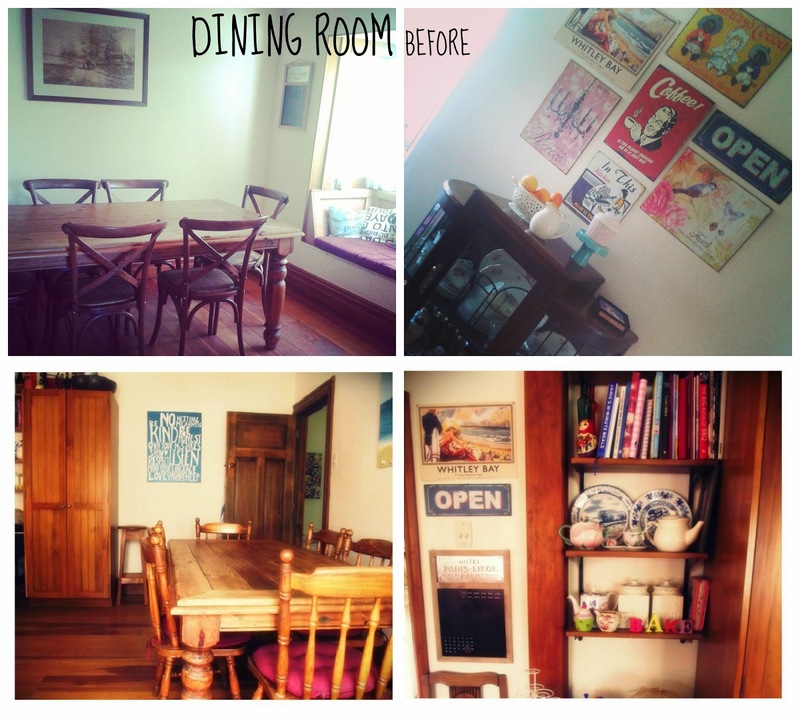 So there you have it, my DIY kitchen-dining makeover. 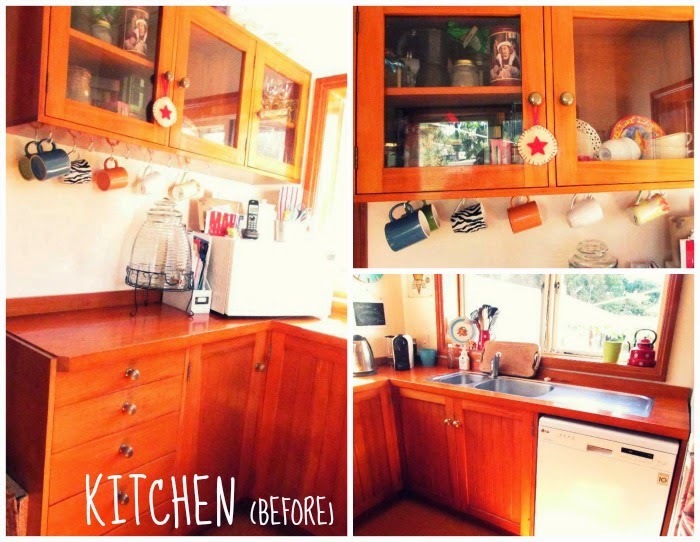 A fresh new kitchen for the cost of the paint and a wooden hutch dresser. Brilliant.